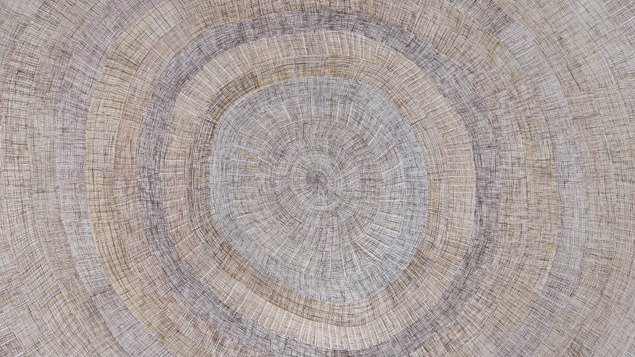 Marking the Infinite presents the work of nine of Australia’s leading Aboriginal women artists. While many of them have established reputations in Australia, for many this exhibition represents their American debut. Revered as matriarchs in their communities, the artworks made by these women are proud assertions of who they are and represent the pride they have in their communities. This strength of vision is immediately evident in works that shimmer and swirl, that assert their authority like lightning bolts, or sparkle like the night sky. Although hailing from some of the most remote communities on the planet, the work of the nine women artists in Marking the Infinite speaks loudly and clearly to our contemporary age. The artists are: Nonggirrnga Marawili, Wintjiya Napaltjarri, Yukultji Napangati, Angeline Pwerle, Carlene West, Regina Pilawuk Wilson, Lena Yarinkura, Gulumbu Yunupingu, and Nyapanyapa Yunupingu. The works in Marking the Infinite are drawn from the collection of Debra and Dennis Scholl, Miami-based collectors and philanthropists. The exhibition was originated by the Nevada Museum of Art, where it was organized by William L. Fox, Director, Center for Art and Environment, and Henry Skerritt, Curator, Kluge-Ruhe Aboriginal Art Collection of the University of Virginia.